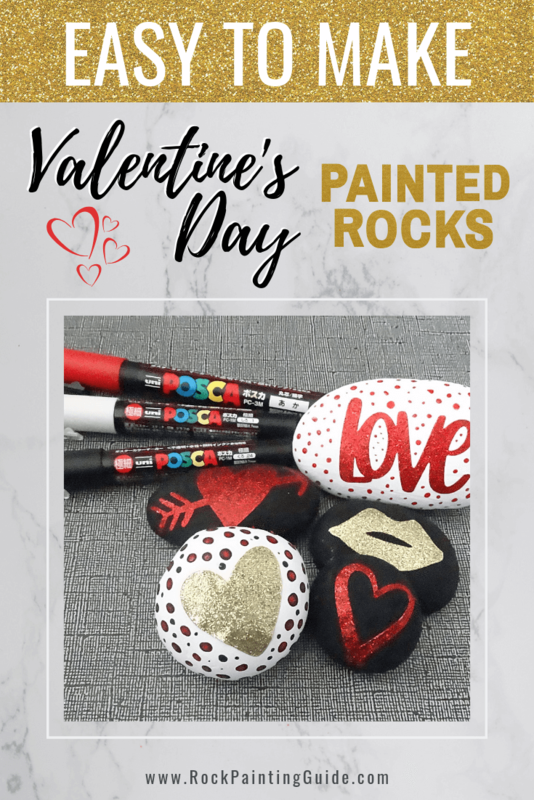 These quick and easy glitter Valentine rocks are the perfect rock painting activity that your kids will love! Why not, make these glitter Valentine rocks with your kids for their next Valentine’s Day class party. Are you new to rock painting? Here’s how in 5 easy steps! Grab a bag of rocks from your local home improvement store, rock yard, or even your own backyard. Clean the rocks by using soapy water to remove dust or dirt. Let dry completely before starting the project. Depending on your design, plan on painting a base coat and let the rocks dry before decorating. Decorate the rocks with paint, markers, stickers, whatever you want works! There’s no right or wrong way to decorate a rock. Seal the rocks with a clear spray sealer. This will protect the painted rocks from scratches and UV sun/water damage. That’s it! 5 Extremely Simple Steps to start rock painting today! Craft Acrylic Paint is the best paint to use for rock painting. Acrylic has a nice medium consistency that’s suitable for rock painting. Tempura Washable Paint. The tempura paint becomes more translucent after drying. Paint Markers are perfect art tools for beginner rock painters. Less mess and fewer supplies needed. What to do with the rocks once it’s painted and sealed? The possibilities are endless! Here are a few craft ideas! The kindness rocks trend, I think is here to stay! Write inspirational messages on your painted rocks. Display your rock art and turn them into magnets for others to admire. Be creative with learning time. Use painted rocks to make learning fun for preschoolers. Decorate and use your painted rocks as markers in your flower pots and vegetable garden. Decorate your home with holiday-themed painted rocks. Raise awareness for a cause in your community with painted rocks. Discover new ways to decorate rocks, using alcohol inks, chalk, crayons and more! Hide and Seek Rock Hunting is a fun outdoor activity to do with your children at any time of the year. Prep the rocks with a basecoat using acrylic paint or using paint markers will work too. Let the rocks dry completely before adding the stickers. I found these cute glitter Valentine theme stickers from Target. Press the stickers down firmly on the rocks. Decorate the rocks using the paint markers however you want. There’s no right or wrong paint to decorate a rock! After the Valentine glitter rocks are completely dry. I applied mod podge to the rocks to help adhere the stickers and to prevent future peeling. 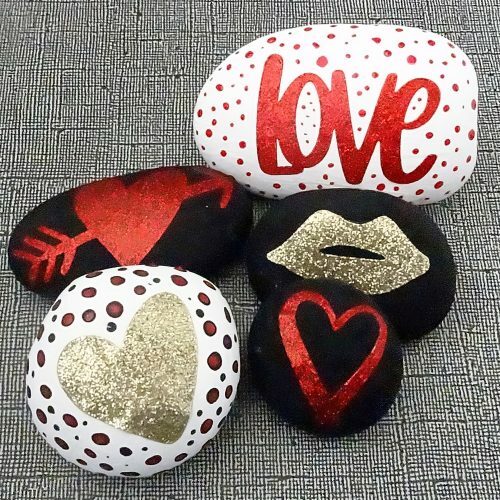 I hope you enjoy these awesome Valentine glitter rocks painting craft. Want more Sweet Rock Painting Ideas? See this helpful post on Easy Valentine’s Day Rock Painting Crafts Roundup for more inspiration. Visit our Art Toolbox Essentials page for our favorite art supplies and tools! Show me your rocks! Join our Facebook Group and post your creations for all to see and admire!